The following suggested walks are featured on this site. Click on the header or the picture on the left to go to the walk. Each walk includes an OS map of the route. The OS map includes a tool which enables panning in and out. The OS OpenSpace maps are not as detailed as the OS Leisure (OL28) Explorer Map for Dartmoor which should be used in conjunction with these maps. Many of the routes are lengthy which is a necessity if using public transport. Some of the routes can be adapted and shortened by the use of a car, check the OS Leisure map or walking guide books for suitable parking. 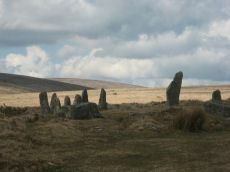 There are many good B&Bs and campsites around the moor and wild camping is permitted. If new to walking on the moors then try the shorter walks first. 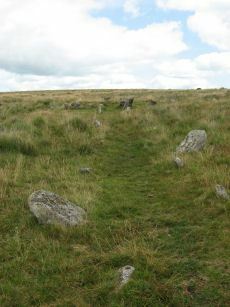 Walking on Dartmoor can be very enjoyable but this can be spoilt if you are not sufficiently prepared. Ensure you have suitable walking boots, clothing and plenty of food and water. The OS Leisure map and a compass are essential and water proofs are advisable as the weather can change suddenly on the moors. The unexpected can happen on long walks so let someone know where you are going in case there is a problem as there will be no mobile phone reception on large parts of the moor. Allow at least 1 hour for every 3km (less than 2 miles) or at least 4 hours for 10Km. The 20km walks can be done in around 8 hours but ensure there is plenty of time left to get that last bus home! Enjoy! UPDATE SUMMER 2017: Most of these walks were based on the now discontinued Transmoor Bus service. Clearly the A to B walks are no longer possible but we leave them here since routes can be adapted. At the time of writing it is possible to get from Plymouth to Yelverton and from there to use the Target Travel 98 service to stops including Princetown, Two Bridges and Postbridge and Merrivale and Tavistock. The Warren House Inn is no longer served by a bus service. 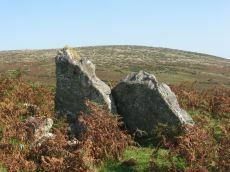 For day trips it is only possible to get to the central moor from Exeter by getting a bus or train to Plymouth or Okehampton and then starting from there. For more details see The Guide to Public Transport page. ROUTE: Short walk. Start Sharpitor Car Park Sharpitor Car Park. Distance 11km. 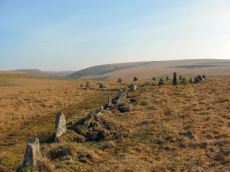 SITES OF INTEREST: Hart Tor Double Stone Row & Cairn Circle, Down Tor Stone Row and Cairn Circle. ROUTE: Long walk. Start Burrator Inn. Finish Sharpitor Car Park. Distance 17km. 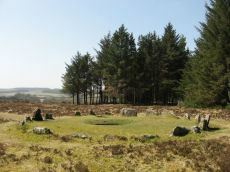 SITES OF INTEREST: Yellowmead 4-circle Cairn. Drizzlecombe Complex. ROUTE: Long walk. Start Burrator Inn. 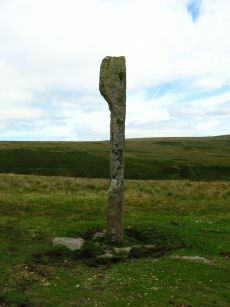 Marchant's Cross. Ringmoor Down. Legis Tor. 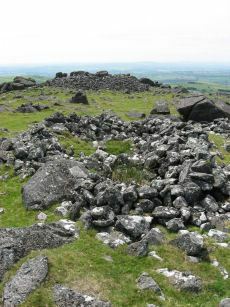 Great Trowlesworthy Tor. Ditsworthy Warren House. Drizzlecombe. Deancombe, Burrator. Finish Sharpitor Car park. Distance 20km. 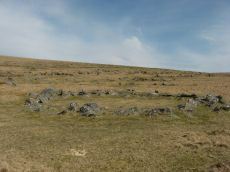 SITES OF INTEREST: Ringmoor Down Cairn Circle. 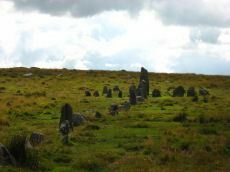 Brisworthy Stone Circle. Legis Tor Settlements. 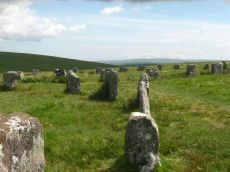 Trowlesworthy Settlements, Row and Cairn Circle. Drizzlecombe. ROUTE: Easy medium length walk. Start Ivybridge Train Station. Stowford Bridge. Butterdon Hill, Piles Hill, Glasscombe Corner, Corringdon Ball. Finish Ivybridge Train Station. Distance 16km. PUBLIC TRANSPORT: Daily train to and from Ivybridge. ROUTE: Easy medium length walk. Start Ivybridge Train Station. Davey Cross. Butterdon Hill, Piles Hill, Glasscombe Corner, corringdon Ball, Butter Brook reservoir. Finish Ivybridge Train Station. Distance 15km. SITES OF INTEREST: Cuckoo Ball & Corringdon Ball Chambered Tombs, Butterdon Hill Long Cairn, stone rows on Piles Hill, Glasscombe Corner, Butterdon Hill & Butter Brook. 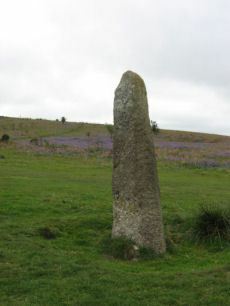 Butter Brook settlements & standing stone. ROUTE: Short walk. Start Moretonhampstead. Mardon Down. Clifford Bridge. Finish Steps Bridge. Distance 10km. PUBLIC TRANSPORT: Exeter to Moretonhampstead via Dunsford (Country Bus 359) runs Monday to Saturday. The last bus from Moretonhampstead to Exeter leaves at 16.16 to return to Exeter. This still leaves plenty of time for this walk. ROUTE: Short walk. Start Moretonhampstead. Butterdon Hill. Cranbrook. Fingle Bridge. Clifford Bridge. Finish Steps Bridge. Distance 15km. Allow 4.5 hours minimum. PUBLIC TRANSPORT: Exeter to Moretonhampstead via Dunsford (Country Bus 359) runs Monday to Saturday. The last bus from Moretonhampstead leaves at 16.16 to return to Exeter. This still leaves plenty of time for this walk. ROUTE: Long Hilly walk. Start Okehampton. Follow East Okement to Belstone Common. Over Belstone Tor and on to Little Hound Tor. Round Cosdon Hill to South Zeal and Sticklepath. Distance 16km. PUBLIC TRANSPORT: Dartmoor Line train Exeter to Okehampton (Summer Sundays only). Gunnislake/Plymouth to Okehampton (Summer Sundays only). Return by bus on Sundays from Sticklepath to Okehampton using Western Greyhound 510 & 599. This walk is also possible using the daily Western Greyhound 510 & 599 service. These services tend to vary from year to year so check the guide to public transport. ROUTE: Easy walk. Start Postbridge, over Lakehead Hill and Bellever Tor to Dunnabridge Pound - return to Postbridge via Laughter Tor. Distance 11km. ROUTE: Easy walk. Start Postbridge. Path through Pizwell. Cator Common. Soussons Down. Vitifer Mine. Challacombe Down. Finish Warren House Inn. Distance 12km. ROUTE: Easy walk. Start Princetown. Finish Princetown. Distance 11km. ROUTE: Long walk. Start Princetown (for Merrivale). Finish Princetown. Distance 21km. FIRING RANGE NOTICES: Langstone Moor is within the Merrivale Firing Range. 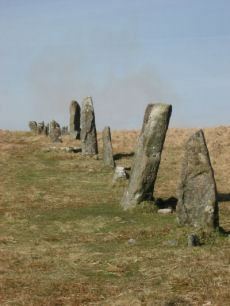 Check Dartmoor Training Area Firing Notice for the Firing Programme before walking this route. ROUTE: Easy walk. Start Warren House Inn. Hurston Ridge to Fernworthy reservoir. Fernworthy Forest to Grey Wethers. Finish Postbridge. Distance 13km. PUBLIC TRANSPORT: Walk originally based on the discontinued Transmoor Bus Service. The Warren House Inn is no longer served by a bus service. ROUTE: Long walk. Start Warren House Inn. Fernworthy reservoir. 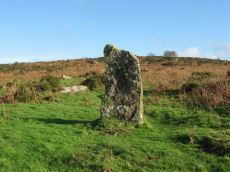 Thornworthy Tor. Middle Tor and Kestor. Batworthy Corner. Scorhill Down. Shovel Down. Fernworthy. Finish Warren House Inn. Distance 17km.